In these movies like ‘Divergent’, our heroes and heroines need to learn fast if they want to save the world or overthrow the system. Similarly action packed films are ‘Snowpiercer’, ‘Never Let Me Go’, and ‘Sucker Punch’. But what I took away from this film was the idea of a girl who’s got to figure things out very quickly to earn her place and take down the dark forces controlling the city. 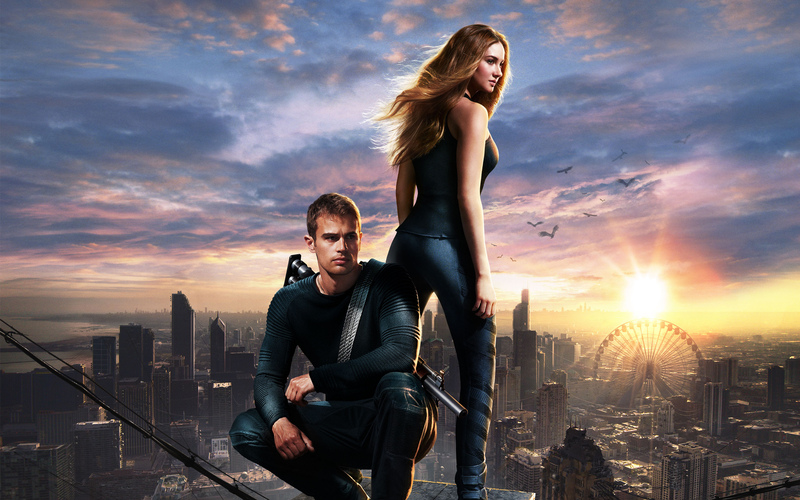 Looking for other ‘Divergent’-like movies and outstanding examples of dystopian cinema? Read on! By the way, if you haven’t read the book, do so now! If you thought that Neill Blomkamp’s ‘Elysium’ was a bleak enough dystopia, brace yourself now! This movie is what George Orwell would write if he wanted to set ‘1984’ aboard the mad Blaine the Mono from Stephen King’s ‘The Waste Lands’. Grim and fatalistic, this picture packs a chilly, compelling punch. The apocalypse has already happened, with the planet transformed into a frozen block of ice. The last dregs of mankind have sought refuge aboard an ever-moving train barrelling through the icy landscape. The central conflict deals, of course, with a major class struggle, with most of the refugees hunkering in the ghettoized tail section of the train. The privileged few live in the front cars (I’m sure any similarities to the basic concept of the bus boycotts that started the civil rights movement are intentional), and the ragged masses congregating in the rear are sick of the oppression. A rebellion begins to foment. Set at a similar time; these two stories are hard not to group together, but the different themes and the power of their stories set them apart. Set in a future, post-World War III society where emotions have been outlawed, ‘Equilibrium’ tells the story of John Preston (Christian Bale), a government agent who begins to have doubts about the policy he is enforcing. On its surface, after a brief action-oriented beginning is basically a progression from a fairly complex sci-fi film (meaning simply that it takes a lot of explanation to get up to speed) to a thriller to a “gun fu”-styled actioner. The progression is carried out skilfully by Wimmer, with all of the genres somewhat present throughout the film. Wimmer is so austerely slick here that this movie sometimes resembles a postmodernist automobile commercial. The transition from genre to genre is incredibly smooth, though. Loads of action and even bigger effects should put this on every ‘Divergent’ fan’s watch list. If that’s not enough, both movies know that the way to solve any problem is with a massive showdown. Based on a novel about people who give up their lives to serve others, this movie is also a story without villains. It’s like a merciless Greek drama, leading our characters to their inevitable end. ‘This brief tragedy of flesh’, as Emily Dickinson would have it. Don’t be fooled into thinking this is a science fiction movie. It’s not. It’s a human drama with a science fiction premise. This is not like ‘Logan’s Run’ and it really does not go into the details of the science behind the plot. It’s a sad and melancholy story about the human condition. If you go into it knowing what to expect, it’s highly recommended. A world apart, but greed and power still consume everyone. The story itself is captivating, but unlike ‘Divergent’, you may be left feeling confused at the end. Like ‘Divergent’, ‘The Host’ puts a young heroine at the front of a battle to save her family and friends in a dystopian future. Aliens known as ‘Souls’ are attaching themselves to humans minds and taking over their consciousness. Our guest contributor has already recommended the book by Stephenie Meyer, and while The Host has accumulated mixed reviews, I think the strong cast of Saoirse Ronan, Max Irons, Emily Browning and Diane Kruger among others, help to qualify this as a very watchable movie. YA fiction beginnings and a dystopian future setting are just two of the reasons why ‘Divergent’ fans should see ‘The Host’, and while there alien plot’s a change of direction, the mind control aspect brings it right back. Like ‘Divergent’, ‘The Hunger Games’ (Gary Ross, 2012) and similar movies, ‘Ender’s Game’ is set in a dystopian future. Ender is selected for an elite military training programme where he struggles to fit in, getting into fights with other recruits in and out of the practice arena. I found the training process very similar to the harsh realities that Dauntless recruits go through, and there’s even a Faction-style divide as they’re split into teams. ‘Ender’s Game’ and ‘Divergent’ both take place in societies where young citizens are forced to take on huge challenges, with outsiders earning respect through achievement. Here, the stakes are even higher. Admittedly, I only caught it because of Emily Browning’s connection to Lemony Snicket’s ‘A Series of Unfortunate Events’ (Brad Silberling, 2004). This near-undefinable movie sees her star alongside fellow Australian actress Abbie Cornish for a journey through multi-layered fantasies. The disturbing premise of ‘Sucker Punch’ is that ‘Babydoll’ has been sent to an asylum – thanks to a false accusation – to keep her from revealing a dangerous truth. As she plots her escape, ‘Babydoll’s mind wanders through increasingly fantastical settings where she can physically fight her battles. ‘Sucker Punch’ has a very different plot and overall tone, but if you were fascinated by ‘Divergent’s simulations, you might like this movie. So what if society as a whole was out to get you and the only way to survive was to fight? There’s no need to imagine it, here are three films like ‘Divergent’ that may have you looking over your shoulder every few seconds. If you’ve picked up the book or manga of ‘All You Need Is Kill’ (Hiroshi Sakurazaka, 2004), you’ll know you can expect a tough environment for Tom Cruise and Emily Blunt’s army recruits. A marketing guy is pressured to join a front-line squad in the fight against an alien invasion, and finds himself caught in a never-ending loop. Every time he dies, he starts the day over again, rejoining the fight with the help of allies who can’t remember their last meeting. Sure, it’s got all the elements of a monster movie, but it goes to an entirely different place. In a tightly regulated system, new recruits thrown in too soon – yes, apart from the alien side of things, this Tom Cruise sci-fi movie has key similarities to ‘Divergent’. Youthful Jeff Bridges stars in a movie that has generated a cult following. A computer developer hacks his way into his own system, but finds himself trapped inside the code itself as a player in a deadly battle. While ‘Tron’ dates from the earlier days of personal computing and gaming, ‘Tron: Legacy’ (Joseph Kosinski, 2010) picks up the story eighteen years later with Garrett Hedlund as the developer’s son. Trapped inside a coded world instead of a highly controlled one, ‘Tron’ shares ‘Divergent’s theme of fighting a faulty system (albeit with a ton of personal computer-inspired effects). The government (referred to as The Alliance or Parliament) sends an “Agent” with no rank or name to hunt down Simon (Sean Maher), Serenity’s resident Doctor and his sister, River (Summer Glau), who is the real target. Why is River Tam, the 16-year-old sister of a brilliant alliance Doctor such a threat to the worlds of the alliance? What could this girl have that’s so important they’d ruthlessly kill anyone in their path? From start to finish, there are no wasted moments. All your emotions will be engaged. You’ll laugh, you’ll cry, you’ll gasp in shock. What you won’t be is bored. Don’t plan on being able to take a bathroom break or get more Coke and popcorn. You won’t want to miss a second of this one. If you exclude the setting and the space theme, these films are quite similar. Discrimination, racism, power issues. All present here. The story takes places right after the first movie; the T-Virus has now escaped into Raccoon City and has infected many, slowly turning them into Zombies. I’m a huge fan of the ‘Resident Evil’ series (even if it does scare the living daylights out of me); I’ve played and (pretty much) beaten them all, so I have at least some knowledge of the plot of the movie. The Umbrella Corp are as ruthless as ever, and as usual, Alice (Milla Jovovich) has to fight her way out to stop them! Bang on, I’d say! The truth is out and now our heroes must live with the repercussions; but whereas ‘Divergent’ is focused on power, this movie is based on horror and gore. OK, so I must admit I only went to see this because of the Wachowski sibling’s involvement. I went in expecting to hate this movie about a terrorist, but it was so much more. While not an action picture, there’s plenty of action and at least one funny homage to ‘The Matrix’. It’s very inspiring – believe it or not – and it didn’t make me want to blow up buildings either. It just made me appreciate freedom even more. Hugo Weaving is terrific and Natalie Portman leaves Princess Amadala far behind with her performance as Evey. ‘V for Vendetta’ pits a criminal against an oppressive government, but unlike ‘Divergent’, there’s no higher moral calling. Should Movies Stick to Their Factions? I don’t think so, and these films show that you don’t need to follow the same template to have something in common. If you know some great films similar to ‘Divergent’, let us all know! Add your recommendations to the comments.